Enjoy the season while you can college football junkies because the season is almost over. We’ve passed the 10-week mark and division races are beginning to come into focus. It was a wild week in the SEC, but the Big Ten and Big 12 had critical games that are sure to impact the playoff picture. Here are the top fives studs and duds from week ten of the 2018 college football season. Pitt had quite an ugly run during nonconference play, but they’ve seriously turned it on against their ACC rivals. Pitt got what may be their biggest win of the season in week 10 with a 23-13 victory of 25th ranked Virginia. Pitt’s defense made a lot of great plays, but running back Darrin Hall was the star of the show. Hall rushed for 229 yards and completed a hattrick with a trio of touchdowns on the ground. He also saw a number of targets in the passing game. Quarterback Kenny Picket had a really rough night, but the Panthers were able to run their star running back. The Panthers close the season against Virginia Tech, Wake Forest, and Miami. They likely need at least two wins to reach a quality bowl game. What was once thought to be a very diverse and very competitive SEC turns out to be the same two team juggernaut like last year—Alabama and Georgia. LSU and Kentucky had a chance to tango with the titans of the SEC, but both were shut down in uncompetitive matches. Alabama shut out the Tigers 29-0 nothing and at no point did it look like LSU had a ghost of a chance. Tiger Stadium was loud and proud all night long, but the Alabama front was just too much for LSU to handle. Tua Tagovailoa didn’t put up Heisman numbers, but he still had a pair of touchdowns and was very efficient all night. Kentucky only lost by 17, but make no mistake, that game was also very much a blowout. Wildcat quarterback Terry Wilson had a strong performance, completing 23 of his 29 passes, but the team struggled to run the ball. 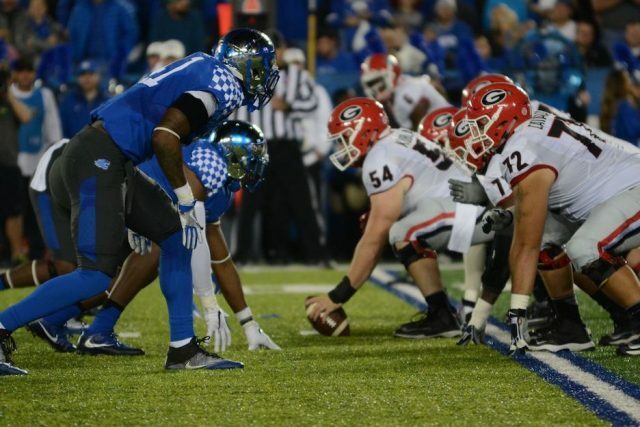 Kentucky only had 84 rushing yards on the evening. Alabama and Georgia are likely to meet in the SEC championship game, where Georgia is going to need a win if they want to make it to the playoff. Clemson scored a whopping 77 points against the Louisville Cardinals on Saturday. You read that right. Not only did they manage to score 77 points, but they did it without a truly great individual performance. The team totaled 11 touchdowns on the afternoon, but no one except quarterback Chase Brice scored more than three. Travis Etienne, Tavien Feaster (2), Lyn-J Dixon, and Dexter Lawrence all ran in touchdowns on the ground. Justyn Ross, Tee Higgins, Amari Rodgers, Will Swinney, and Trevion Thompson all caught receiving touchdowns. Isiah Simmons capped it all off with a 27-yard interception return. The Tigers likely could’ve hit the century mark if they weren’t so poor at rebounding…wait. Things have taken a dark turn for the Iowa Hawkeyes in recent weeks. Nate Stanley and company were off to a nice 6-1 start and looking to compete for the Big Ten West division title, but things have gotten out of hand. Last week Iowa was up double digits on the road but allowed Penn State to crawl back and win the game. This week the team traveled to Purdue where the Boilermakers were able to pull off the upset—one week after knocking off the Buckeyes. Purdue quarterback David Blough picked apart their secondary with 333 yards and four touchdowns while Nate Stanley couldn’t make enough splash plays to win the game. The Hawkeyes close the season with matchups against Northwestern, Illinois, and Nebraska. They need a win over Northwestern and some help to reach the Big Ten Championship. I haven’t been very kind to Boston College over the course of this series, but I’ll give credit where credit is due, they had a monumental win this week. The committee ranked them at 22 overall in the first playoff ranking of the reason and they followed that surprise move with a big win against Virginia Tech. The offense didn’t have a standout star, but they still came together for a strong 31 point outing. Quarterback Anthony Brown didn’t have great numbers, but he spread the ball around and kept the Hokies offense off guard. Running back AJ Dillon was four yards shy of the century mark but he did score a rushing touchdown. The Eagles defense is what really lead them to glory, however, as the unit held Virginia Tech to 21 total points. They gave up over 300 yards and didn’t manage a sack, but they did force two turnovers and got off the field when they needed to. They illustrated the bend don’t break mentality at its finest. I’m not sure where to begin with this one because the entire Maryland Football program is a mess. The university for some baffling reason opted to reinstate head coach DJ Durkin following the investigation into Jordan McNair’s death—only to fire him two days later. The team is in the midst of yet another average season and this whole fiasco is going to make recruiting an absolute nightmare. The coaching staff and entire athletic department need to take a long hard look at where they are and determine how they’re going to right the wrongs of the last several months. On the football side of things, the team hosted Michigan State, who routed them by a final score of 24-3. The offense was never able to get in rhythm despite a weak performance from Spartans quarterback Brian Lewerke. The highly anticipated showdown between the Penn State Nittany Lions and Michigan Wolverines was a pretty big dud. Michigan quickly jumped to a 21-0 lead en route to blowing out Penn State 42-7. The Wolverines playoff chances are looking quite nice at the moment. I went back and forth on whether to criticize Ricky Rahne and the Penn State offense or to praise the Wolverines stout defense, but I came to the conclusion that both are warranted. Penn State’s offense was putrid. The wide receivers continued their season-long struggle while the already injured Trace McSorley was running for his life on every play. Miles Sanders never really had the chance to do anything because the team had to abandon the running game rather quick. The Nittany Lion’s struggles shouldn’t take away from the stellar performance of Michigan however as the Wolverines defense is legit. The secondary swallowed receivers whole while the front seven looked on par with Alabama. Jim Harbaugh should be able to ride a strong running game with suffocating defense the rest of the season. This is a bit of an unconventional addition to this list but they are simply the best announcers in college football and deserve a shout out. The two called the thriller between West Virginia and Texas this week and they enhanced the viewing experience by light years. They are an absolute joy to listen to week in and week out. So much for Utah being good. The committee opened their first ranking by pinning the Utes as the 15th best team in the country. That decision isn’t looking very good right now as they were beaten by the Arizona State Sun Devils in convincing fashion. Running back Zack Moss once again had a strong performance, but he was pretty much the only player to do much of anything. Both Utah quarterbacks had rough nights while the defense was completely shredded, allowing 38 points. The PAC-12 isn’t looking too good right now given how disappointing the likes of Washington, Stanford, USC, and Oregon have been in the second half of the season.